Wearing a short-sleeve T-shirt in the frigid cold with his face painted black and gold, the cadet joined other West Point classmates in taunting their rival midshipmen Saturday before the Army-Navy game. “We beat Temple! We beat Temple!” they belted, referring to the Army’s first win of the season to the Temple Owls, a team that managed to beat Navy in the American Athletic Conference championship game a week before. The midshipmen waited until it was their turn and then quickly responded with a chant of their own: “14 years! 14 years!” – the number of years since the last time Army won against Navy on the gridiron. A few hours later, the day got much better for Kauffman and his fellow cadets when the Army sneaked by with a 21-17 victory over their archrival. At the annual event, known as “America’s game,” the pageantry of marching cadets and midshipmen joined a sellout crowd of loyal fans who fervidly cheered as the teams faced each other for the 117th time. “It’s one of the greatest rivalries of sports history,” observed Chief of Staff of the Army Gen. Mark A. Milley before the game. Three days after the 75th anniversary of the Pearl Harbor attacks, which catapulted the nation into the war, Milley said, it was an appropriate time to honor the 82nd, the Army’s only paratrooper division. “We wanted to single out the 82nd as a tribute to soldiers from World War II who formed the greatest generation,” Milley said, adding that each and every Army division is special. Retired Command Sgt. Maj. Kenneth “Rock” Merritt, who jumped into enemy territory with the 82nd during the D-Day invasion, represented the division at the game. While attending his first Army-Navy game, the hardy 93-year-old sergeant major wasn’t shy about his love for the 82nd, but he also commended today’s military. Seven cadets then marched out to the center of the field to meet seven midshipmen for a “prisoner exchange,” a tradition in which members of both academies who have studied in a semester-long exchange program are returned to their brethren. 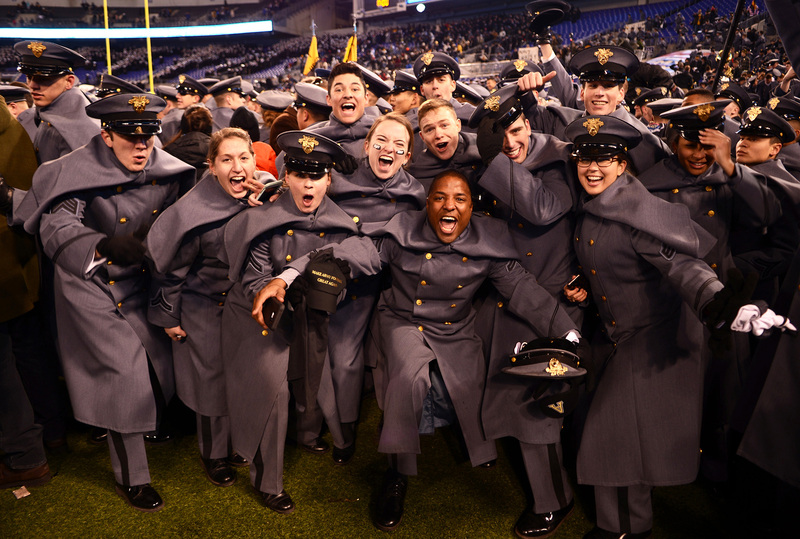 Even if the game’s winning score was what the cadets ultimately wanted, Ferrer and others agreed that the spirit of the yearly matchup is a worthy experience in itself.